New offerings include guided team building carried on the farm, vineyards, meadows and the Roman remains of Ajdovski gradec nearby. 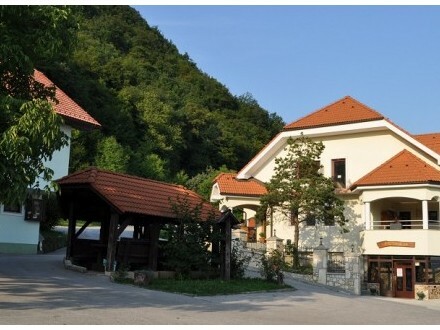 The tourist farm Klenovšek Grobelnik in the municipality of Sevnica offers guests typical dishes of this part of Slovenia. Their speciality is a wine grower's feast, a range of meat dishes, buckwheat, struklji, the potica, various breads and cakes. Groups, anniversaries and weddings are offered regional and indigenous food. Guests are taken to the exhibition showing the farm's history and the 150 year old guest room where the liqueur wine is served. All products are offered in a small shop for taking home or for gifts. The offerings include wine, grape juice, wine and herbal liqueurs, teas and jams. A speciality is a jam from the indigenous red žametna črnina. A view of the cellar is organized with a sommelier and wine degustation. The offer is complete with accommodation in rooms. Accommodation for pets is also vailible. There are many places for hiking and cycling accompained with the natural and cultural heritage of the land. Participation in farm work is also possible (e.g. grape harvest).